Amazon makes it very clear that no actual Kindle device is required; that you can download Kindle reader versions for your Mac, PC, iPad, iPhone, or other mobile device for free—and then read Kindle books on your device-that-is-not-a-Kindle without having to actually buy a Kindle. However, the Amazon directions for how to do this aren’t very specific (or at least I haven’t been able to find clear directions). As a newbie Kindle e-Book publisher, I’ve been surprised at how many emails I’ve received from people wanting to read my Kindle e-Books on their iPhone or iPad—but unable to figure out how. It’s pretty easy. So here goes. First, with your iPhone or iPad go to the App Store and find the free Kindle app for your device (the easiest way to find it is to search for “Kindle” in the App Store). Install the Kindle app for your iPhone or iPad respectively (note, the Kindle apps are listed as published by AMZN Mobile LLC). Open the Kindle app. Tap the Home button to go the main Kindle screen (if you are not already there). On the app’s Home screen you’ll see a little round i icon—for “Information”—on the lower right. Tap it. The Info menu will open. On the Info menu, select Settings. The Settings menu will open. On the Settings menu, choose Register this device. When prompted, provide your Amazon login and password, and give the device a name you choose, for example “Harold Davis’s iPhone”. Now that your device has been associated with Amazon account, assuming you have wireless connectivity you can buy a Kindle book, download it, and start reading it right away. To do this, go back to the Home screen, and tap Shop in Kindle Store in the upper right. In addition, when you first buy a Kindle book—possible using your Mac or Windows PC—you can choose to download it to your iPhone or iPad using the drop-down Deliver to menu under the Buy Now button on the right side of the screen. But suppose you’ve previously bought a Kindle book such as my Eros: Sensual Portraits and are trying to figure out how to get it over to your mobile device? Make sure you are logged into your Amazon account. Click Your Account to manage your account. Scroll down to the Digital Content area and click Manage Your Kindle. In the Manage Your Kindle window scroll down until you see Your Orders. Each Kindle order you’ve made is shown with a little plus icon next to it, as you can see in the figure. Figure 1: Each of your Kindle orders are shown in the Your Kindle Orders list. Click the plus icon to expand the Kindle order. You can now use the drop-down list to send your Kindle e-Book to any mobile device you have registered—such as your iPhone or iPad—as you can see in Figure 2. Figure 2: When you expand an item in the list of Kindle e-Books you have ordered, you can send it to your iPhone or iPad. I made this image from five bracketed captures shot in the autumn of 1997, combined primarily with Nik Software’s new HDR Efex Pro. 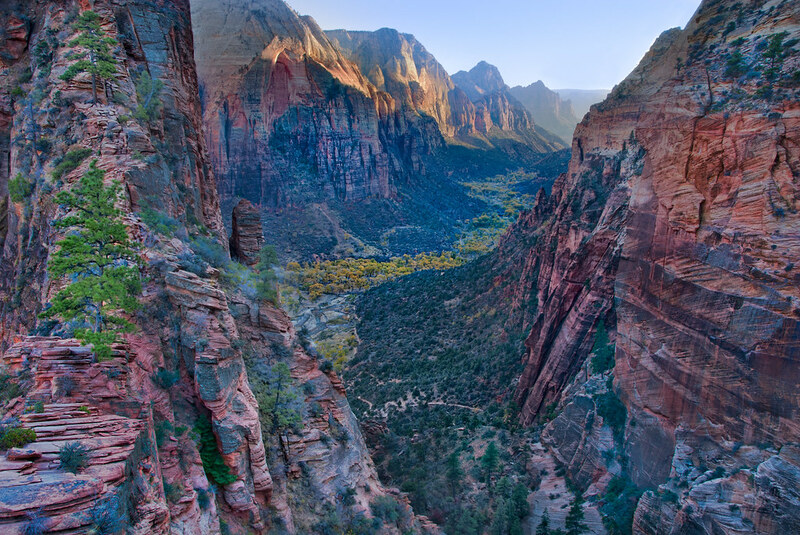 Taken near sunset, I was standing on the narrow neck of land leading up to Angel’s Landing in Zion National Park, Utah, above the set of switchbacks known as Willy’s Wiggles. This is the kind of location that is great for photography but gives one a feeling of vertigo because of the drops to the valley floor in several directions. I used a tripod to make sure the composition of each image was identical, and bracketed shutter speeds using Manual exposure mode. I’ve tried a couple of times to combine these images, and HDR Efex Pro is the first software that has let me get results I am happy with. In other words, Nik Software has done a great job. I am very impressed with this program. Like the leading HDR competitors—Photomatix from HDR Soft and Adobe Photoshop’s Merge to HDR Pro—there are strengths and weaknesses. A detailed review and analysis must wait until I have more time, but my first take is that this software is more intuitive and easier to use than HDR Soft, and more powerful than Merge to HDR Pro. I’ll probably use all three, depending upon the specific set of images I want to combine. My further understanding is that any automated HDR software is going require further tweaking following the image combination and tone curve application. You can read more of my thoughts on this issue in the context of Photomatix in Tone Poem. 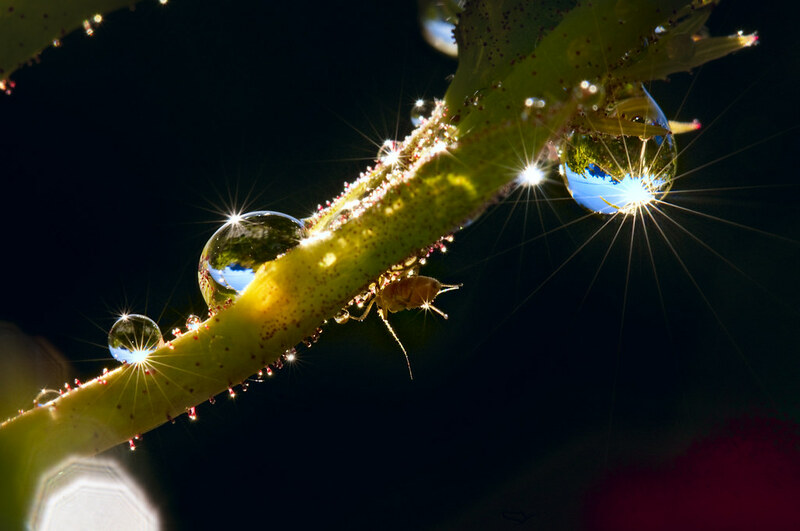 In other words, there is no one-size-fits-all magic HDR bullet. That said, if you are interested in HDR you probably won’t go wrong with HDR Efex Pro. Worth noting: I am often a proponent of using layers and masking to create hand-processed HDR images in place of automated HDR processing. My methodology for multi-RAW and hand-HDR processing is explained in The Photoshop Darkroom and The Photoshop Darkroom 2. Disclosures: Nik Software kindly provided me with a review copy of HDR Efex Pro. 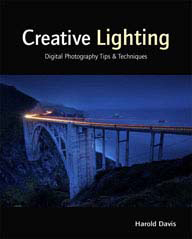 Also, I am in the process of planning a book about HDR photography. 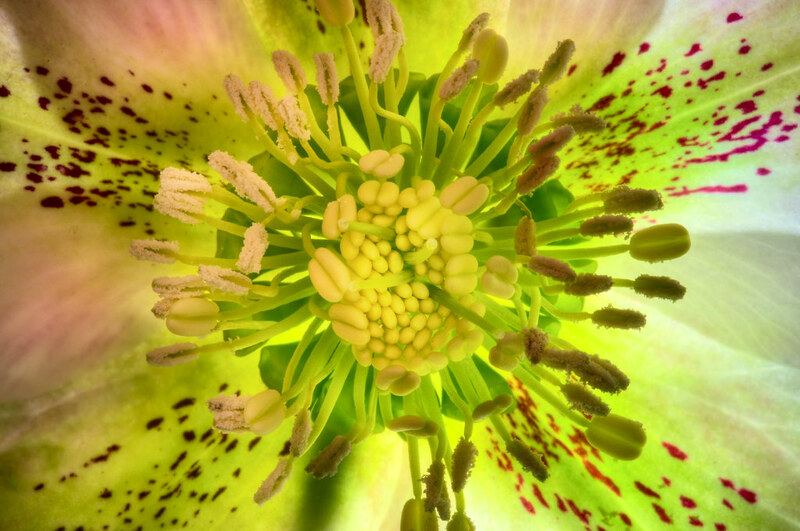 Sunny Side Up, photo by Harold Davis. View this image larger. This is a post about technology. Mostly, I like to write about photography and Photoshop in my blog—but sometimes in this modern world you got to get down and hands-dirty. It’s a rotten job, but someone has to write about the mechanics of what makes this stuff tick. Without the software stack my blog wouldn’t be available to all of you I hear from who read what I write. If the mechanics of blogging bores you to tears you can skip this one—there’s plenty of other stuff to read on my site, like several thousand blog stories, mostly about photography. 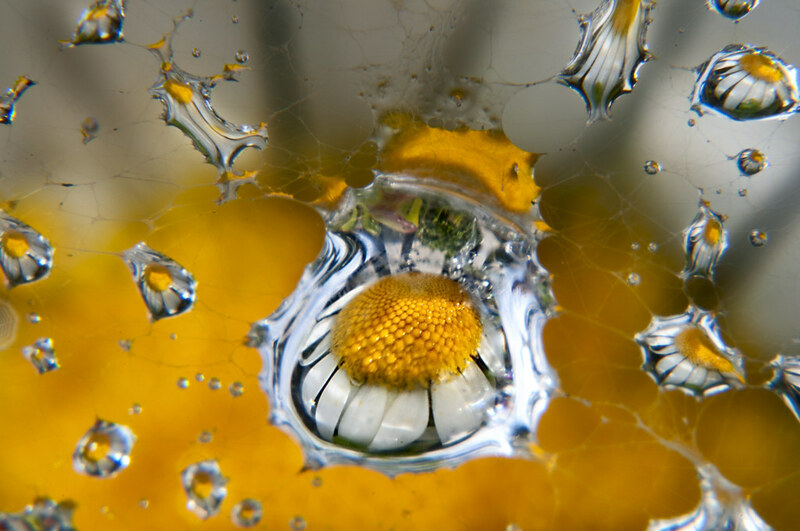 Before I get there, let me briefly note the image above of a flower reflected and refracted in a water drop caught in a spider web. Shot with my 200mm f/4 telephoto macro, a 36mm extension tube, and a +4 diopter close-up filter: very, very close. A companion shot: Orbit. Now to the live-by-technology bit so here’s where you should click a link into my archives if you are a technophobe. Hey, 2008 was an interesting year—here’s May, 2008 the month my daughter Katie Rose was born. I’ve noted before that my blog is an electronic version of a daybook, such as the one kept by Edward Weston. See also Nearly Naked Women for a related story. With its thousands of entries, this blog is an important part—and explanation—of my work and life. However, it is inherently fragile—as are all electronic constructs. A WordPress blog needs many “moving parts” to keep running—a web server, database, and the PHP language to name a few of the more obvious. A few days back I decided to add a plugin to my WordPress installation that would allow me to keep better track of readers of my blog who are signed up to get daily emails via the Google Feedburner service. Among other things, this service turns my syndication feed into an email for people who sign up for delivery this way. By the way, if you’d like to sign up for the service, follow this link to my subscriptions page. More specifically, the Feedburner Stats WordPress plugin uses the FeedBurner Awareness PHP API to access the FeedBurner feed data and the Google Visualization API to show this data in my WorPress control panel—at least theoretically. The problem I had was that the plugin crashed with an internal syntax error. Its developer very nicely pointed out to me that PHP 5 was required—and my web hosting service was running PHP 4.4.9. Well, I could probably live without the Feedburner Stats plugin, although why should I have to do without my toys? But its developer also brought to my attention a much bigger issue: with WordPress version 3.2, WordPress will stop working on PHP versions below PHP 5. This is something that should make anyone with a WordPress blog sit up and pay attention. By way of background, WordPress is a wonderful, open source blogging tool written in PHP—and there has always been an “arms race” between the large WordPress development community and the probably equally large number of hackers out to corrupt and infiltrate blogs. This partially accounts for the rapid, incremental versioning of WordPress. We’re now at version 3.01, and version 3.2 is not far away, maybe six months at the most. One pretty much has to keep one’s version of WordPres up-to-date. To not do so is to ask to be spammed. To repeat, if you are not running PHP 5, your WordPress installation will not be upgradeable—or will mysteriously “Go South” when you try to upgrade it—in a matter of a few months. Very serious indeed for a committed blogger. It turned out that getting my PHP upgraded to the current version was a much more complex issue than simply bringing this to the attention of my webhosting service—for reasons mostly having to do with the internal architecture of the hosting company. It took a couple of headaches and hours of my time, and the webhosting service was really pretty good about helping me along. I’m glad I upgraded, because this way my “blogging lights” won’t go out mysteriously when I try to upgrade to WordPress 3.2—what a mess that would be. It’s much better to have a little lead time on these things, so I’m writing this by way of warning to anyone who is in a similiar situation: upgrade to PHP 5 now! Good Morning Spider, photo by Harold Davis. View this image larger. This image of a spider and morning water drops graces my review of Nik Software’s Color Efex Pro filter set. The review is now live on Photo.net. For quite a while art director and art agent types have been bugging me to publish an online portfolio. The complaint is that it is hard to find what I’m about as an image creator and photographer with all the stuff I’ve put on line. It’s true I have literally thousands of images on line and in the four years I’ve been blogging I have more than two thousand stories about photography. Yes, the material is tagged and searchable, organized with a taxonomy and human-readable site map, but even so it does not fit the concise and focused look of a top-of-the-line portfolio, which tends to be have relatively few images with some fancy (and flashy) user interface elements. So last week I bit the bullet and decided to program my portfolio page and slide show in Flash. You can see the results on www.photoblog2.com, which as also serves as a new entrance portal to this blog. As an experienced software programmer, how hard could it be? Well, in fairness I need to say “ex programmer”—it’s been years since I’ve coded much of anything. And, at the possible expense of losing my über geek status, I’ll admit I found the Flash development environment a beast. Not so much the ActionScript programming language, which is a relatively clean implementation, but the whole construct of what goes where, with a stage and timeline in every application, and so on. The heavy lifting in my application was done with a set of add-on Flash components from SlideShowPro, which are very elegant, but also complex, and with documentation that leaves a great deal to be desired. I wanted something simple, elegant, and clean to best show my work. Sometimes simplicity is the hardest thing of all to achieve. Well, it was a week lost to Flash development: but at least the beast is done, and I learned how to do it! Late in the afternoon of a bright autumn day I arrived in Yosemite Valley. The valley was already in shadow, with only the tops of the surrounding cliffs lit by the sun. I stopped along the banks of the Merced River. With my camera on my tripod, I snapped five exposures of the scene, all at the same aperture (f/7.1). My exposure time varied from 1/15 of a second to 1/125 of a second. The longer exposures captured the details in the shadows, but blew out the highlights on the cliff tops and the sky, while the shorter exposures rendered the sky acceptably, but lost all nuances in the reflections in the river to darkness. My plan was to combine the exposures to create one image with the best characteristics of each individual exposure. 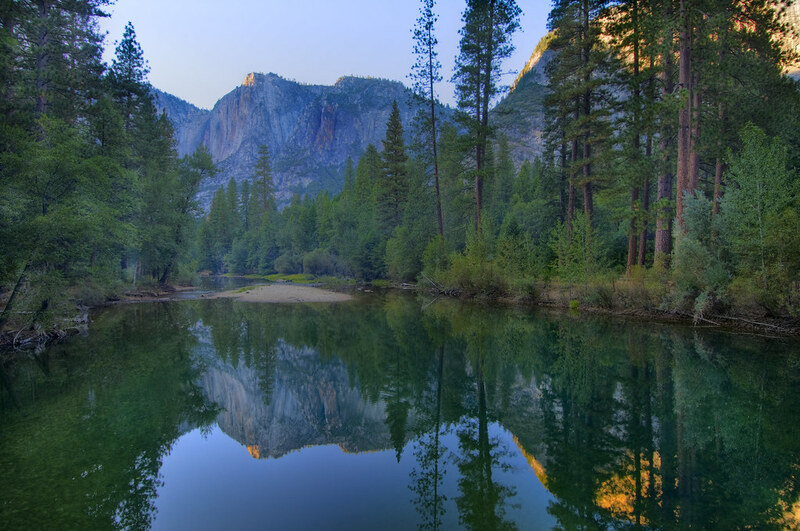 Yosemite Afternoon, photo by Harold Davis. View this image larger. 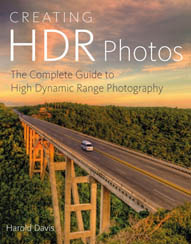 Combining multiple captures to create an image with an exposure range beyond that possible in a single capture is known as High Dynamic Range imaging, or HDR for short. The trick is to compress the extended range into a single image that is pleasing, will display on a monitor, and is reproducible. Note that the exposure latitude within a single RAW capture also gives rise to the possibility of using HDR techniques using different versions of the one RAW file as the input, a technique that I’ve dubbed multi-RAW processing. Whether combining different exposures, or different versions processed from a single exposure—or even both these techniques at once—my approach has been to work in Photoshop to use layers, masking, the Gradient tool, and the Paintbrush tool to combine the variants. You can see an example of the results of this hand-crafted approach to HDR in the six-exposure blend that I used to create Yosemite Morning, taken the day after I shot the series used to create the Yosemite image that accompanies this story. I’ll be writing more about the details of my hand HDR process in an upcoming book—I also teach the technique in workshops—but for now let me mention some downsides: it is labor intensive, time consuming, can look funny if the layers aren’t masked very carefully, and can be close to impossible to achieve in areas that involve complex interconnected details in mixed light. Since we live in an age that tends to want instant results, most people try experimenting with software the does the HDR for them. I’m no exception, but I’ve been unimpressed with Photoshop’s HDR automation. So I was excited recently to get to play with Photomatix, which is probably the leading HDR software. The Yosemite image above, and the floral close-up below were both created in part with Photomatix. As you’ll see, the words *in part* are crucial to understanding Photomatix’s place in my scheme of things. With Photomatix, HDR generation is a two-step process. You open the images in Photomatix, and the software generates an HDR composite. Then, in a process called “tone mapping”, you tweak the settings used in the mathematical algorithms that reduce the tonal range in the combined image in order to generate a single attractive and reproducible version. As a practical matter, I found Photomatix’s rendering of my RAW files unacceptable. So my workflow went like this: I opened the set of images in the Adobe Camera RAW plugin, applying the same settings to each (experimenting with different RAW conversion settings on each file included is also possible, of course, although it adds more variables and complexity). I opened the files that resulted from these conversions in Photoshop, and saved them in the TIFF format (because Photomatix doesn’t read native Photoshop PSD files). Next, I opened the TIFF files in Photomatix and generated the HDR composite. As the documentation warns, the HDR image doesn’t start out looking too good, so I worked to tone map it for more attractive characteristics. When I was satisified that the image was the best it could be, I saved it as another TIFF file. Some parts of the resulting HDR image were pretty wonderful (for example, the trees on the right). Others, not so good (the sky had a burnt, burnished quality, and the water was murky). I ended up layering-in versions in Photoshop to fix portions of the Photomatix generated image (the same general remarks are true of the floral image that also accompanies this story). If my workflow with Photomatix sounds like a lot of work, you are right, it was. Then again, I’m happy to work if it helps my work (if you catch my drift). Also, my life would have been simpler in Photomatx if I’d shot in-camera JPEGs. The truth is that the markets for my work often require extremely high resolution, and JPEGs just won’t do. I’m almost never happy with JPEGs compared to my results when I do the RAW conversion. Paradoxically, I’m left with an appreciation both for what Photomatix can do with HDR, and for the limitations of the software. I’m sure I’ll be using this software to process some portions of my imagery, just as I’m sure that my final versions will require hand work and layer masking with other versions of the files. If you are an image creator who cares about your craft, the limitations in HDR software amounts to a good reason to learn hand HDR—combining many different versions shot at different exposure times, and processed individually from hand-tweaked RAW conversions, using layer masking—even if you expect to primarily be using automated HDR programs like Photomatix. When you use Photoshop, nothing is more important than the ability to make selections. As a simple example, when you want to make a composite by moving a person from one background onto another, you need a way to select the person—in other words, to tell Photoshop which pixels you want to move. Besides this kind of large-scale selection, selection is used on a much smaller scale in Photoshop to control the areas you want to change in an image, and for a variety of other reasons. Since you need to be able to select in Photoshop, Photoshop provides a number of nifty selection tools. These include a Magic Wand Tool, and the ability to select on the basis of color range. But it is a sad fact of life for Photoshop addicts like me that we spend much of our life on time consuming and tedious hand selections. The task is made even more difficult by the issue of edge treatment. The edges of a selection should usually be blended using a gradient effect, or your selection will appear jagged and unnatural. It’s not intuitively obvious, but making a selection in Photoshop is logically equivalent to creating a layer mask. Both selections and layer masks are stored as grayscale information. If you have a selection, you can convert it to a layer mask (I’ll explain how in the course of this review); going the other way, it’s easy to convert a layer mask to a selection (by applying the layer mask). For the real technophiles among my readers (I was almost going to say “alpha geeks” but restrained myself), a layer mask is the same thing as an alpha channel. Hmmm! Selection = Layer Mask = Alpha Channel. My preference is to work with layers and layer masks because this is a more flexible option than working with a selection cut out on a single layer. But to get the layer mask I need, I often have to start with a complex and time consuming selection. With this background in mind, I tried out Fluid Mask, a Photoshop plugin (it also runs in standalone mode) from Vertus that is supposed to ease the pain of selecting. Read on for an overview of how the software works, and for my evaluation. 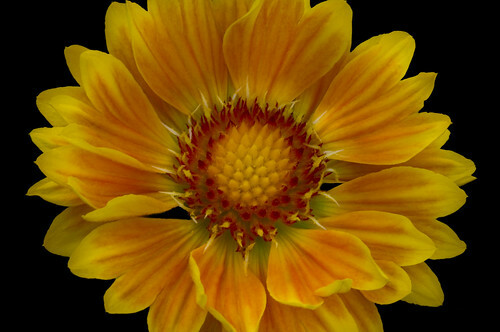 The flower you see above on black, a Gaillardia, was originally on a busy green background (because I photographed it in my cramped side garden). The original image following RAW processing is shown below with the background I wanted to replace. As a first try with Fluid Mask, I decided to try selecting the flower to cut it out and put it on a black background. But before I show you how this worked, I need to make a disclosure. Disclosure: Vertus provided me with the Fluid Mask software for free, as well as some complimentary individual training (but see the note below about the availablity of free online training for anyone). Once Fluid Mask has been installed, you’ll find it as a menu item on the Photoshop Filters menu (at the bottom of the menu items, along with any other third-party plugins you may have installed). With an image open in Photoshop, when you fire up Fluid Mask, Photoshop temporarily closes (“to save resources”) and the Fluid Mask window shown below opens. Note: As a matter of general Photoshop practice I’d advise creating a duplicate layer before invoking Fluid Mask. When I applied and saved my work, Photoshop opened back up, and I was able to quickly fix my botch. I converted my selection to an alpha channel (layer mask) by clicking in the thumbnail in the Layers palette with the Apple key held down (Option key in Windows), and then clicking the little alpha channel icon on the bottom of the pallette (third from left, you can see this in the capture below). Then I added a black layer between my original flower and its masked duplicate. A reveal-all layer mask on the black layer allowed me to “paint-in” the few small areas from my original that I had missed in Fluid Mask. All this took about two minutes. Pros: Greatly speeds selecting and leads to better quality selection. Cons: Complicated to learn, without an adequate manual. The good news: online interactive tutorials are available free five days a week. Product details: Downloads from Vertus cost $239 (in the US) for either Windows or the Mac.